One benefit of an academic career is that a few personal eccentricities are tolerated, and even encouraged as long as we meet our spiralling performance targets, many of which contravene academic freedom. In my case, aside from some strong views on ethical academic practice and publishing, I ride a rather exotic folding bike to work every day at the University of Melbourne, and it ends up folded in the corner of lecture theatres where students fail consistently to marvel at its engineering design and its self-evident contribution to low-emissions urban mobility. In 11 years I have driven to work about three times. I also prefer that my main means of written communication is a laptop and paper – no smartphones and tablets, which simply overwhelm and frustrate me with their app-based software, size, and provocation to be instantly connected and available. This means writing and preparing teaching materials is done in a concentrated spell in front of a decent laptop screen or monitor, at home, at work, or out and about. The laptop, on which the Journal of Political Ecology is also prepared, is carted about on the bike, as all my students know. Frankly, my family hate me using the laptop. When we used to have office PCs I stayed late in the office, but now they say the laptop renders me ‘absent’ from family life, while present physically at home. It signifies the type of mismatched life-work balance that infests almost every academic career, as work pushes into the interstices of domesticity (except for those annoying people who are too efficient for that). In Melbourne’s overpriced inner north where I live, our small house lacks a decent workspace, so I am frequently found at the kitchen table checking emails, grading or editing student papers, running my academic journal or just writing. My laptop ends up co-mingled with dinner, discussions, and school homework tasks. I am a bit better at separation these days, after a sharp telling-off (while my family members then got a smartphone and tablet in 2015, reducing the power of their critique somewhat), but everything I need to do seems to require a screen, and the important stuff can’t fit into an 8 hour work day. The computer even gets whipped out during meals with friends to resolve idle debate about historical events and personalities, or to provide directions, or to show cute holiday photos – tasks where most would at least use a smaller smartphone. But for me this would be one giddy step too far and I have no interest in having a gadget with software that encourages checking every few minutes. So I will live, but the odds were against me given the size and the speed of the vehicle. What accounts for this? When pedalling my leg is the same height as the fender of an Australian truck, and that fracture is understandable and will heal in weeks. But my upper body, next to hit, was protected only by a Berghaus Freeflow hiker’s rucksack with a strong plastic insert, with the infernal laptop, the very object of domestic acrimony, nestled within. It appears it, and a few papers, saved my spine and other internal organs as the truck hit my upper body and I tumbled off down the road. It all acted like a motorbike jacket with its hard inserts around the back and arms. The computer did not come off too well itself, but its hard drive is still intact and it is permanently bent. My own hard drive suffered only a concussion that lasted for days. Laptop redeemed! The moral of this tale is nothing more than needing to keep all road users alert on the road at all times. And, don’t forget the road safety advice that we learn as kids, and then bawl back at them as adults. It is good advice. But of course human behaviour does not always heed it, and I am in no position to be sanctimonious about that. A secondary lesson is to stay true to some core beliefs, regardless of social pressures, but maybe not if they are outrageously dangerous ones. This works both ways, but last week was certainly not a good time for a technological upgrade – and a train to work instead of bike might have helped… My working eccentricities are my curse and in this case, my salvation as well. The incident could also be used to support or refute numerous ongoing arguments about cyclist and motorist behaviour in Melbourne, and the need for transport infrastructure improvements. Yes, people could drive more slowly and we need fewer carbon-emitting vehicles in total, but it was not the absence of bike-friendly infrastructure that caused this particular accident. My case has little to do with the contentious Melbourne East-West link tunnel, that would have sent big trucks right under the site of my accident but has now been scrapped in favour of public transport investment– I could just have well have been hit by a truck on a local journey avoiding the tunnel tolls. Nor has it much to do with bike helmets, about which Australians also argue because they are compulsory here – it was a journey where I probably would have worn one anyway, and in this case the plastic lid did something, although not enough to stop concussion. But the central role played by the laptop has a nice synergy between form and function. It was multi-tasking, at a time when my brain suffered a split-second lapse of concentration. This small academic workhorse and instrument of family disharmony became a vital protective shield. 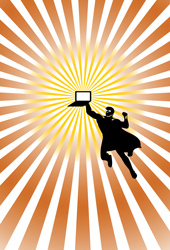 The laptop superhero. The anthropologist Paul Richards has argued that technology is social, and best studied through what he calls technography – the ethnography of technology (Richards 2010). Inspired by Emile Durkheim, he says technology includes the “technique” used to master it (like safe cycling on a bike), and we should not “educate the users to fit the machine but … redesign the machine to respond to the way users use (or abuse) it.” (p4). He means that human inventiveness, actions, and innovation should drive technological design, rather than experts building technology without that input, in the hope that it will be used. Vehicles and bikes as machines often clash, as a recent movie illustrates, but the precise modifications to the streetscape required of planners and engineers need to be observed on the ground and then co-designed, not remotely or through blindly applying ‘best practice’ as so may engineers and planners tend to do. In my case, I do not know what the accident statistics are for the crossing but something must have made me less attentive than the last few hundred times I took it; more warnings or larger signals could have reduced the risk. Bike and ped. tunnels is really what this road needs, but Melbourne builds them almost never. The car lobby is just too powerful privately and in government, followed by the public transport lobby. More crossing time for pedestrians and bikes would help, reducing the tendency to speed across them to beat the lights. We just don’t get our share, often waiting 2-3 minutes. This is bad policy. But at the same time, the laptop had an unintended function and was bestowed with additional powers beyond its prime role as a data handling and retrieval device – this was not designed in by me, or even anticipated. Not something to influence policy design perhaps, but nonetheless I will be eternally grateful. If I ever cycle again in Melbourne, it will travel with me. Richards, P. 2010. A Green Revolution from below? Retirement address, Wageningen University, the Netherlands. *Thankyou to everybody who has supported me over the last few days and I hope I can return favours. There really are nice people in universities, and outside of course. Things are still a bit raw, I have not yet seen the report or written to the driver. This post was rejected by The Conversation – on my first ever submission! Update Dec. 2017. Injuries healed and I returned to cycling in about 4-5 months. I even managed to rejuvenate the Birdy bike – only the seatpost and wheel was run over, it turned out. These days, in England, very cautious. My family made me get a smartphone since I could no longer keep up. I hate it. The laptop works fine but it sitting on a shelf in my office, still bent out of shape. Hi Simon, Glad you got through this alive. As a bike enthusiast who has stopped biking due to the fact that can walk to work, and the incredibly bike-hostile Worcester streets, I sympathize with the plight of bikers in dangerous car-and-truck territories. Rafi was actually saved by a lunch box inside his backpack when he was hit on Main St. right in front of Clark, when walking home with his older brother Ramon. We still have the back pack with the skid marks and torn spots, and the cracked blue plastic lunchbox. It has acquired the status of a ritual object and lives in our attic¦ he was thrown into the air and land and skidded on his back. The hard plastic lunchbox in the pack protected his head and spine. Maybe we should just get bikers and walkers to wear American football gear until we get our streets in order. After Rafi’s accident I came upon two other accident scenes with kids walking to school or bus stops on Main and May St. within a couple months of his accident. With students I investigated the accident rates on Main and May near the schools and bus stops and found that there were many pedestrian accidents night and day. We interviewed the crossing gurads who were really quite fearful for their own sake and the children. One of them quit after a little boy was injured by a car that ran past the crossing guard stop sign. The little boy suffered a serious head injury and the guard was traumatized, saying ”he trusted me and I couldn’t protect him”. We blocked the intersection during the city election campaign, we went to city Hall. Rafi (at age 9) waited til 10 p.m. and testified about his experience at City Hall. Newspaper articles were written; But the city transportation engineer clearly saw his mandate as keeping cars running smoothly and would not agree to an L shaped school zone with reduced speed limits at peak school and school bus stop entry and exit times. We did get on a list as no. 28 waiting for a traffic light (at May and Woodland St.) but were told that the city had not put in a new traffic light for 17 years. They only got new constructions (public or private) to put one in or they got the state or federal government to put in lights on their routes. So we had little hope. 15 years later we got the light – I guess it qualified for use of stimulus finds after the economic crash. So now there’s a light there. I smile every time we stop there. But I wonder how many people were injured in the meantime and how many kids still have to cross in dangerous places to get to school, bus stops, parks and community centers. Maybe we need pedestrian and biker advocates on planning, traffic and transportation commissions. On another note I tried to get the support of the Regional Environmental Council (REC) on whose board I served. They insisted it was not an environment issue. Yet I know that if the wildlife is getting hit by cars in the national parks, it is an environmental issue. Even on the highways they post signs: “Caution Deer Crossing”. We proposed Caution Dear Crossing in consideration of our children, crossing guards, and all the people of our neighborhood. We did carry those when we blocked May St. But REC couldn’t see it as environmental issue. It would be an excellent urban ecology coalition focus. Maybe in your turf too. May you recover soon and completely and may you yet ride the streets of Melbourne. I hope this does not stop your eccentric commute. I have of late had some terrible falls in the colonial landscapes of San Cristobal de Las Casas. I have modified my habits of attention which has helped; but the sidewalks are just plain treacherous. But since walking keeps me whole and strong, I’m still walking, albeit more slowly, not in the rain at night, and with constant attention to the conditions of the surface and my surroundings. Maybe cultivating a sort of pre-human or pre-historic awareness while mobile.
] Maybe they could do a bicycle safety ultimate survival suit, with laptop included. Thanks Dianne, great story. I know those roads in Worcester. In fact I broke my collarbone in a Worcester post-winter pothole in about 1995. So now there are several ‘biking geographers who got knocked off’ stories – Mike Gulliver from Bristol Uni, Jamie Peck from UBC, honorary geographer Rafi and me…I am sure there are others. Traffic accidents are an environmental justice issue,surely. You don’t mention using the laptop in the small hours of the morning – it’s not just at dinner. so glad you are on the mend. Wow. I just caught this news via Nat. Really sorry to hear, and glad that you’re still with us. Its so strange how little things (like having a laptop in a backpack) can make such a huge difference to an incident like an accident. Its incredible you survived being hit by a large truck at speed. All the best for a full and speedy recovery, Simon. Thanks Fiona. Three accidents on bikes in life, all in Melbourne!